How do I opt out of receiving marketing emails from MINDBODY? Looking to opt out of receiving emails from MINDBODY? You've come to the right place! 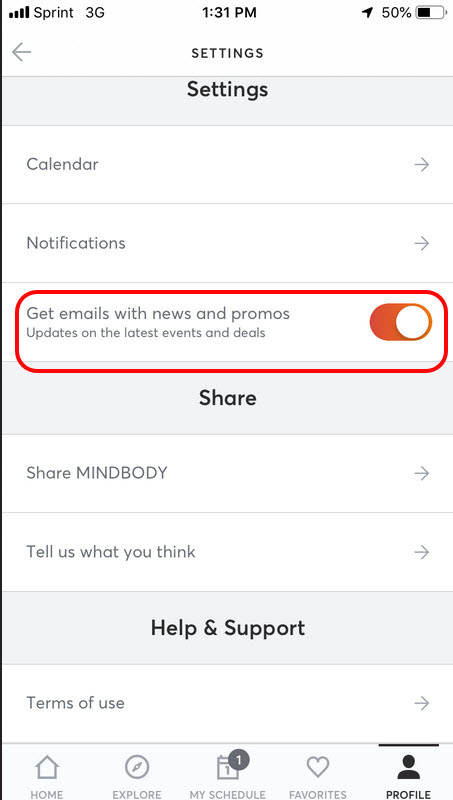 You can edit your communication preference settings within the MINDBODY app to prevent receiving unwanted marketing emails from us. How do I opt out of receiving MINDBODY app emails? Login to your MINDBODY app account and Tap on Profile. Click on the orange slide bar that says Get emails with news and promos. Note: If you're receiving unwanted emails from a business you've attended click HERE to learn how to unsubscribe to emails and text messages from the business.